I have quite a bit of catching up to do, kittens! Last week, a stomach bug tore through my house and brought everything to a stand still. We still have some stragglers for full recovery, but at least we’re starting to do things again that do not involve lying on the couch and napping. Right before the bug hit, I was about to write a couple of quilting blog posts that had to be delayed. I’m going to try and get them both out tonight. 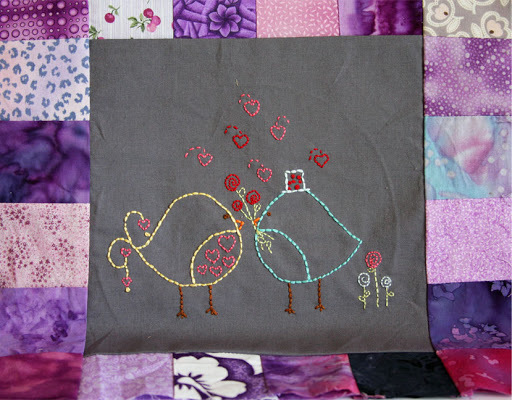 First is the second block in my Birdie Stitches embroider/quilt along. I actually finished this before the 4th and it’s just been sitting around waiting to be photographed ever since. This month, Ms. Birdie apparently finds a mister. The Girl is quite excited about her quilt and happily squeaks about it every chance she gets. I wish she’d get this excited when I knit her things. My guess is that March’s block will feature clover…though, maybe a lion and a lamb? I have to admit that, in my mind, March is one of the more fun months, since it’s not as predictable what the theme could be. Hopefully before the next block releases, I’ll have some of the top piecing finished. I finally found where I stashed the medium gray Kona I’m using for the top and I can get to work cutting it for the sashing. I’m itching to be productive and moving again after more then a week of nothing!